I conceived this piece as part of a series about phoenixes – life, death, and rebirth. I have bipolar disorder, and without medication, my moods cycle between “flying high” – hypomania – and the darkness of depression. This cycle of mood swings has almost killed me twice (read my essay on living with bipolar disorder if you want more details), and I wanted to create a piece that celebrated my breaking free of the cycle ten years ago, when I was finally diagnosed and treated correctly. The phoenix seemed the perfect symbol for this – a bird that dies in flame and is resurrected from its own ashes. At the outset, I had a theme but no idea what the piece would be – a garment? 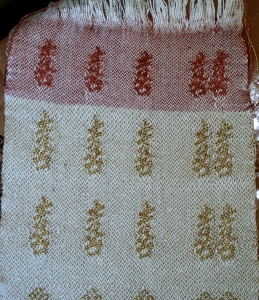 a wall hanging? a sculpture? I made mood boards, mind maps, and lots of sketches, but wasn’t satisfied with any of them – no matter what I tried, no one design captured the ideas I was striving for. It wasn’t until I realized that I didn’t have to capture all the ideas in a single design, but could work in series, producing multiple works with the same theme, that I felt comfortable moving into a single design. 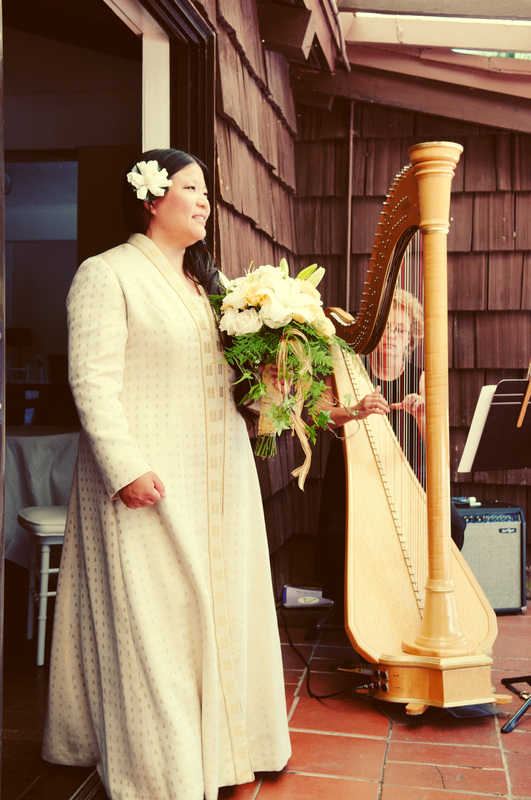 I started by weaving samples – eleven yards of samples! – in very fine threads. I used a turned summer and winter structure with a 120/2 silk ground warp and a 60/2 silk pattern warp. 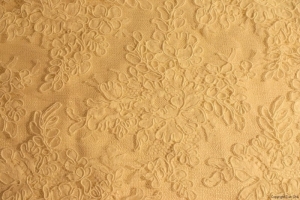 (For the uninitiated, 60/2 silk is slightly finer than sewing thread, and 120/2 silk is about one-third the size of sewing thread. 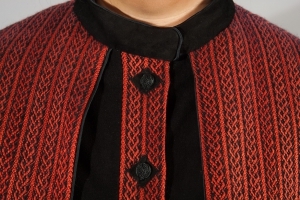 So these were very fine threads indeed!) 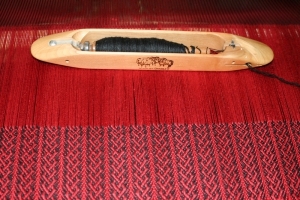 I painted the warp in different colors and dyed different colors of weft so I could try many combinations. 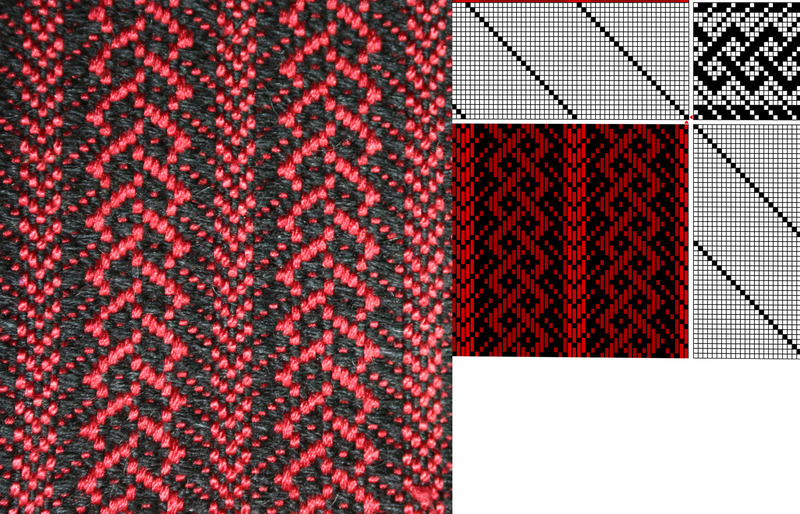 Eventually I settled on two colorways: one in fiery colors, and one with a brightly colored pattern warp and solid black ground warp/weft. 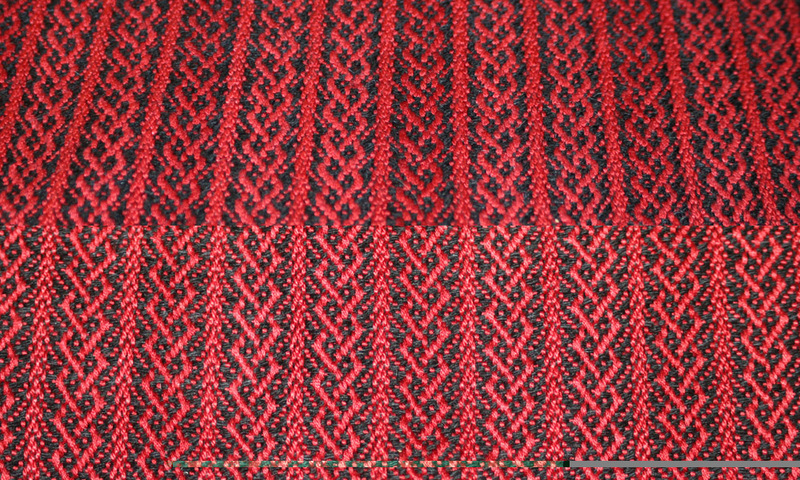 I wove many samples and eventually decided to use two structures: the turned summer and winter I started with, and a mix of double weave and twill (the black phoenixes). I felt that the black phoenixes on the smoky orange background conveyed the idea of “death” nicely, and the fiery-colored phoenixes conveyed the joy of life, but I was puzzling over how to combine them. What finally saved me was a show deadline! 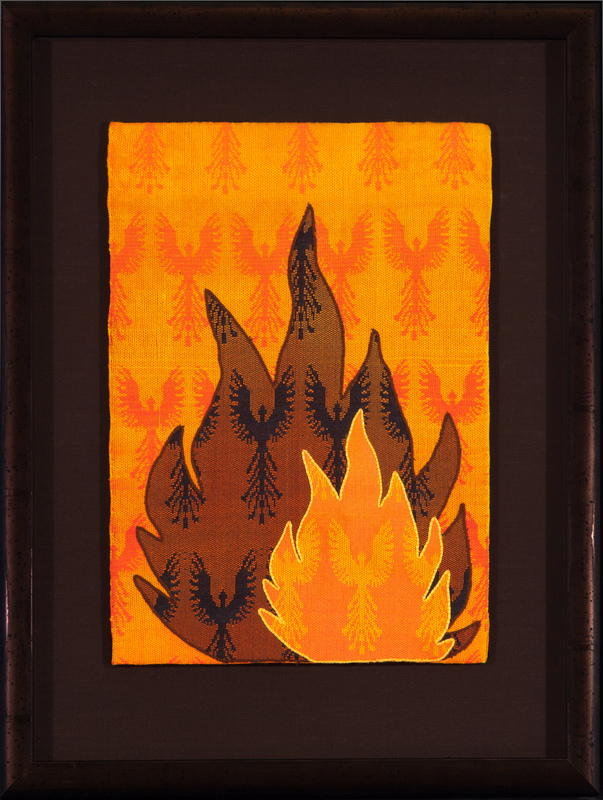 I had planned to enter the Pikes Peak Weavers Guild show Woven Together: Firestorm, commemorating the 2012 Colorado wildfires (some of the worst ever), and was rapidly running out of time to put together an entry. I wanted something to be spot-on for the theme, and eventually it dawned on me that their show was about fire – so why not use flames? I hastily put together a template, and after much rearranging, had the composition I wanted. The two flames on the fiery background show the cycle of death and rebirth – from living phoenixes to dead and desolate phoenixes to vibrant life again. Many thanks to Thrasher’s Framing for mounting the piece and to Joe Decker for the excellent photography! 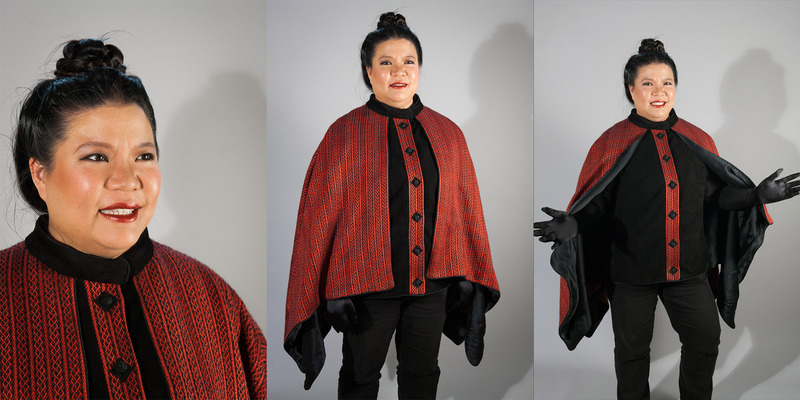 The initial inspiration for my Celtic Braid Cape arrived in 2009, when I was working from home in an unheated garage.Â I live in the San Francisco Bay Area, so it never gets freezing, but winter is still pretty nippy!Â I was wrapping my fingers around a mug of tea to warm them up when I thought how wonderful it would be to have a coat to wear in the garage, to keep me warm as I typed. And thus the idea for the project was born. I have a long-time fascination with Celtic knotwork, and had prepared drafts for many different types of Celtic knotwork. 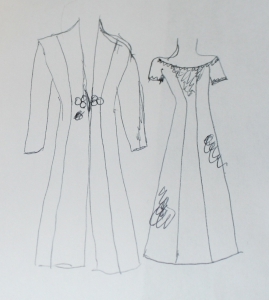 Most of them didn’t work out well in practice – the knot designs tended to collapse when the fabric was wet-finished – but after much experimenting, I drafted a three-strand braid pattern that worked beautifully, in samples as well as on paper. On to creating the fabric! 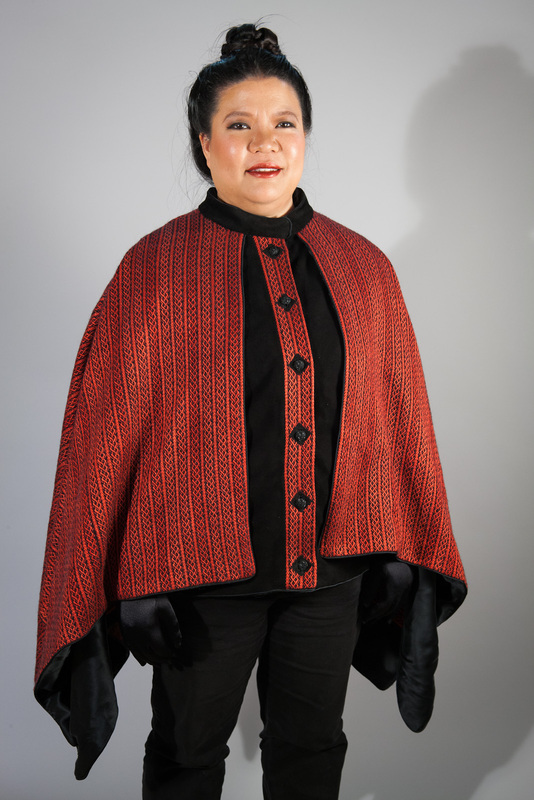 I happened to have on hand some silk yarn, six strands of 60/2 silk loosely twisted together, and some fine cashmere/mohair yarn that I didn’t know what to do with.Â However, there wasn’t quite enough of either to weave the fabric for the coat. So I added some fine wool yarn and some additional bits of silk yarn that I had lying around, to make up the amount I needed. I dyed the silk a beautiful garnet red, and the cashmere/mohair/wool mix a deep black. Because I was cramming the dyepot (always a bad idea), one of the silk skeins came out darker than the others.Â I solved this problem by alternating stripes of the darker color with stripes of the lighter ones, so the resulting fabric has every third stripe darker than the others.Â I actually like this “design feature”; it adds interest to the fabric without being obtrusive. 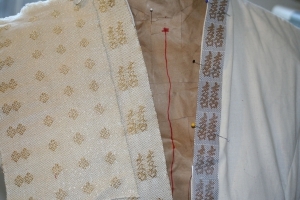 However, I knew I’d need to do considerable work to get it right, especially since I knew nothing about couture sewing. So I labored over many muslins, and over a version in mohair I was using to practice couture techniques. This took several months. 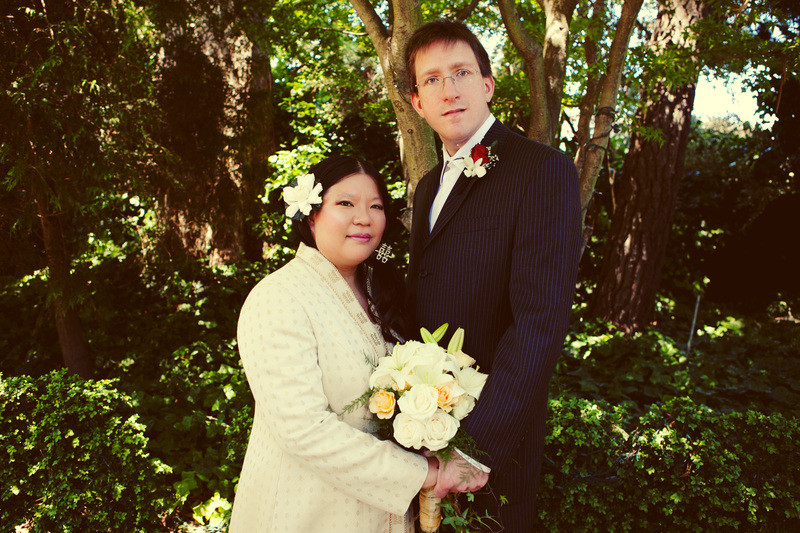 Then, of course, I got engaged! 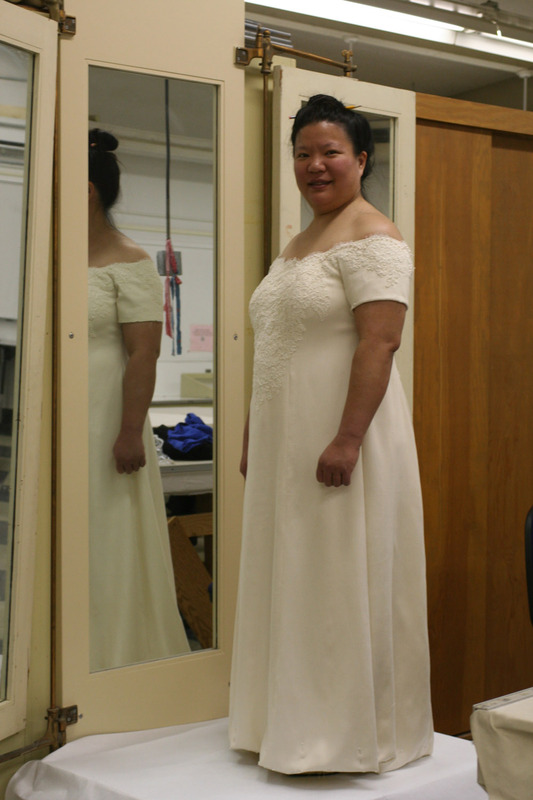 and spent over a year weaving and sewing my wedding dress. 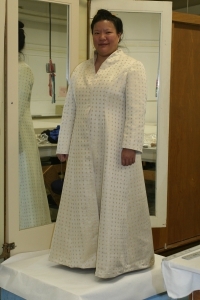 By the time I finished, the impetus for the project was lost, and the fabric languished in my stash for several years. Then Handwoven announced a contest for sleeveless garments, and I spotted a Vogue pattern that would be perfect for both fabric and contest – a cape over a simple vest. I knew instantly that this was the design I wanted to use. 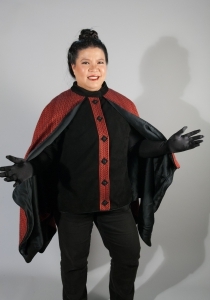 Unfortunately, I was still finishing up my Autumn Splendor project, so I wasn’t able to meet the contest deadline – but the idea was sound, so I moved rapidly ahead with the cape, sewing it up quickly and with a minimum of drama. 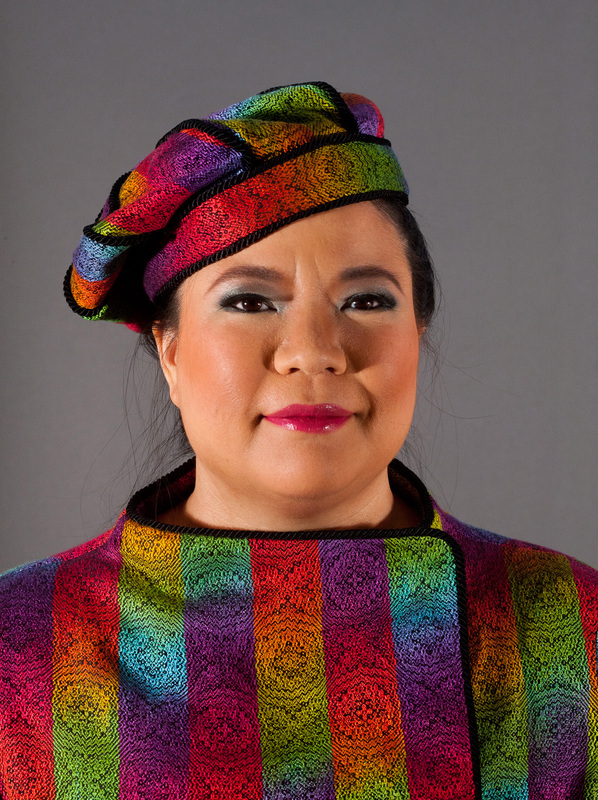 I was ecstatic when Handwoven published it in their January/February 2013 issue! 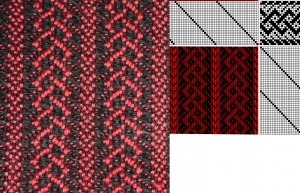 Left, the draft for the project: right, the three-strand Celtic braid draft used in the project. 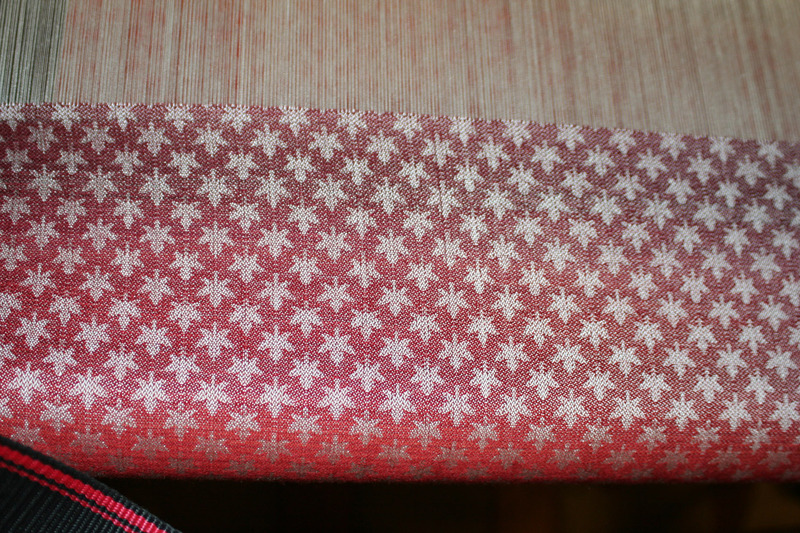 A close-up of the pattern as it is being woven. 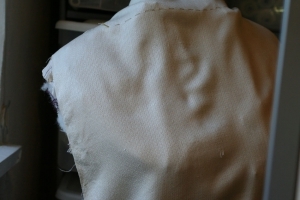 The fabric before and after wet finishing. 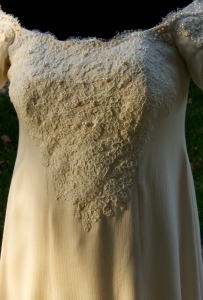 (Wet-finished, top; unfinished web, bottom.) 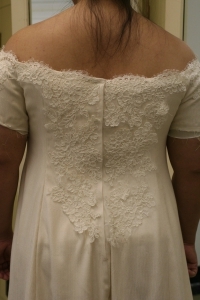 Notice how the lines soften and change to become more smoothly curvy! 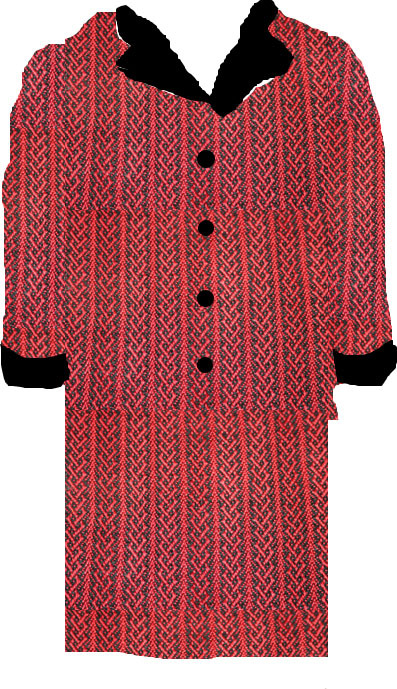 A (crude) Photoshop simulation of the coat. 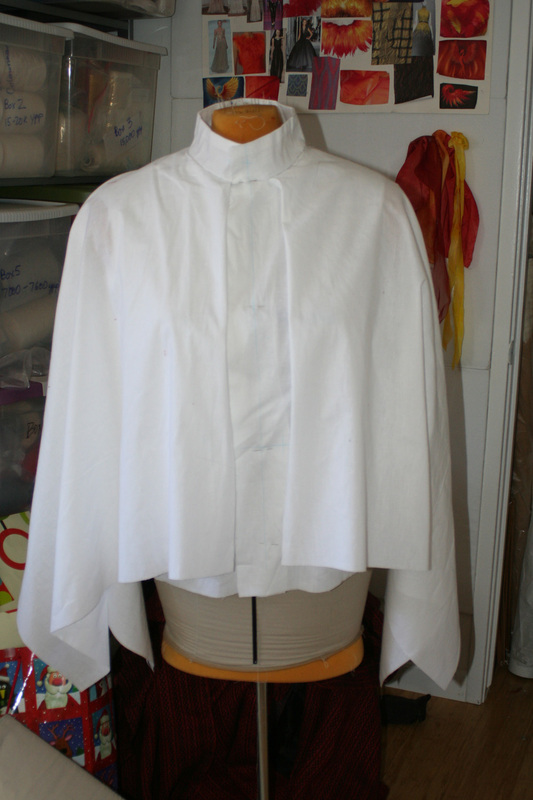 The muslin for the first coat concept. This project evolved profoundly over the eight months I worked on it. 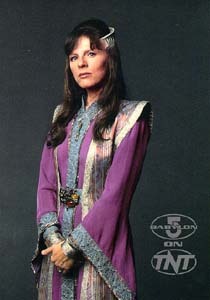 Â The garment design took its original inspiration from a TV space alien’s robes, then changed to a long, straight-cut jacket, and finally to a swing coat with dramatic curves. 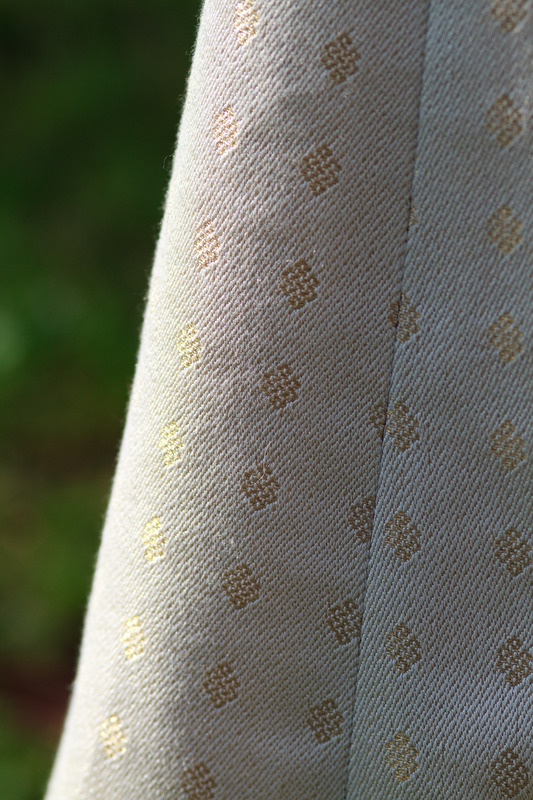 Â The handwoven fabric started withÂ dÃ©vorÃ© – autumn colored “leaves” floating on a gold mesh – and evolved through several iterations to finish with a maple leaf pattern with dyed weft and cross-dyed fabric. 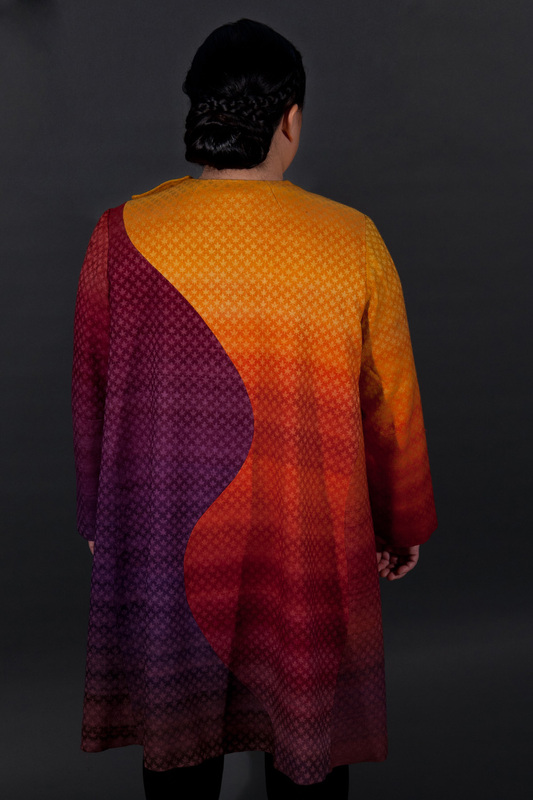 I loved the flowing “feel” of the garment, which is captured in Autumn Splendor, though the lines are profoundly different. 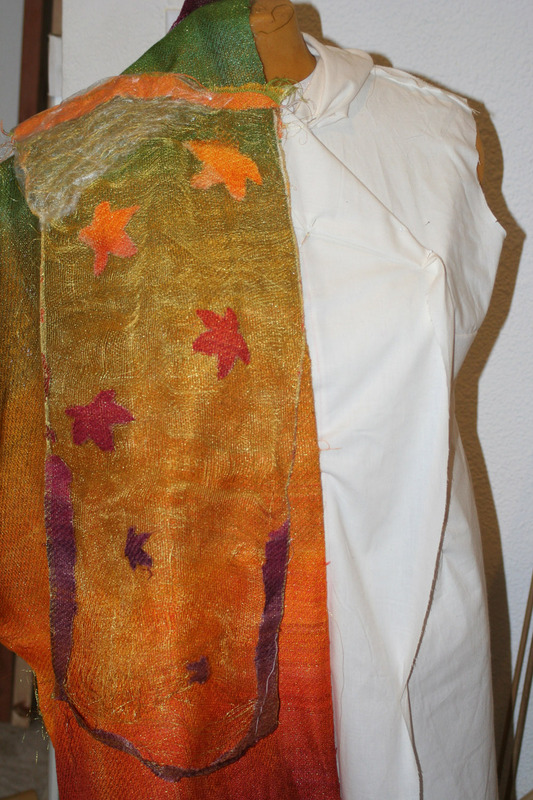 I want to do more work with the “Autumn Splendor” theme ““ developing the concept into something more concrete, something I can actually embody.Â Right now I have a vision of falling maple leaves, glimpses of gold glitter, and brocade over flowing silk.Â I have to figure out how to transform that into something I can actuallyÂ make. One of the ideas I have been playing with is the transient nature of autumn.Â As a child, I was fascinated by the leaf bookmarks that my parents would bring home from Taiwan ““ leaves treated with acid to burn away the soft parts, leaving only the spidery, skeletal veins.Â It reminded me a little of the decorations people put up around Halloween ““ except this was a skeleton leaf, not a skeleton person.Â Same thing: beauty in transience, delicacy in death’s remnants. 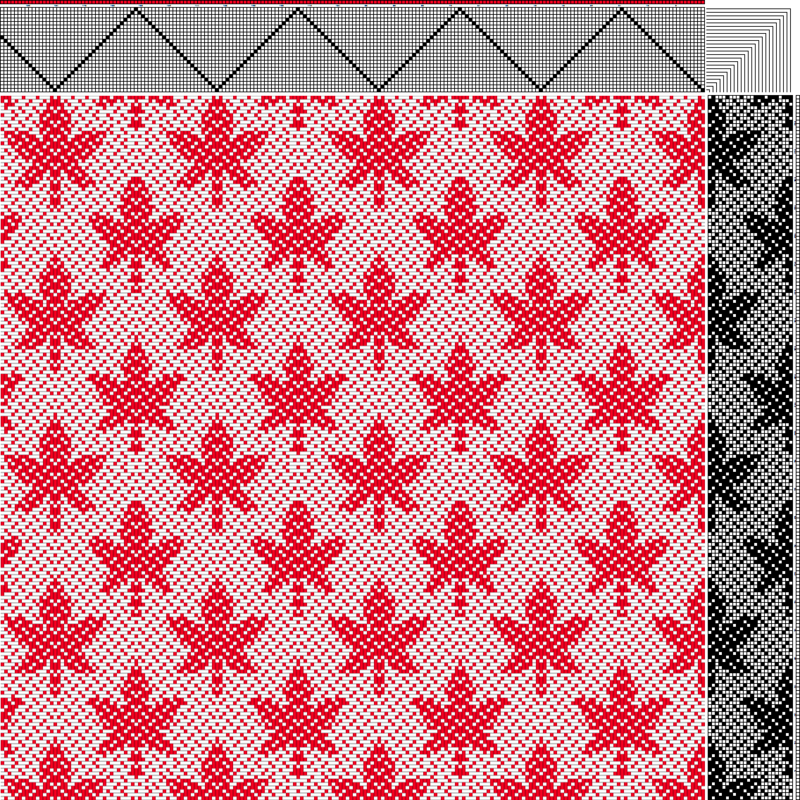 So I really liked the idea of “ghost leaves”, skeletal remnants of a woven design suggesting a leaf. Skeletal remnants of a woven design, of course, leads directly to devorÃ©, a technique in which the cellulose components of a fabric are “burned out”, usually with sodium bisulfate, leaving only the protein/synthetic components. 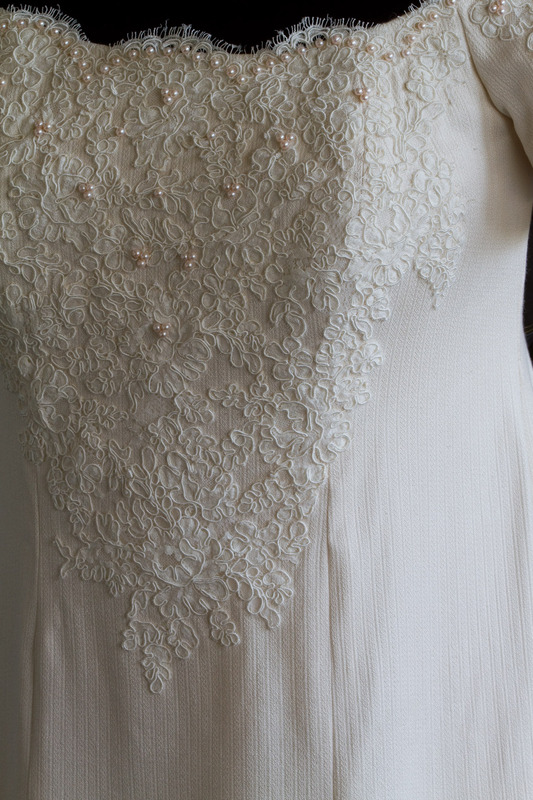 I felt that the devore, while beautiful, simply distracted from the sweep of autumn colors – and was really too delicate for the outer surface of a garment. 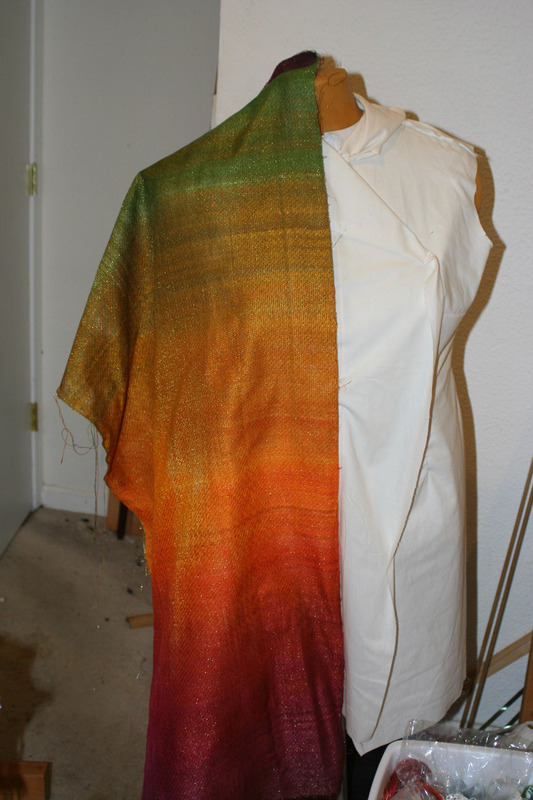 I then overdyed the panel with fiber-reactive dyes, which would dye the silk warp but not the wool weft. 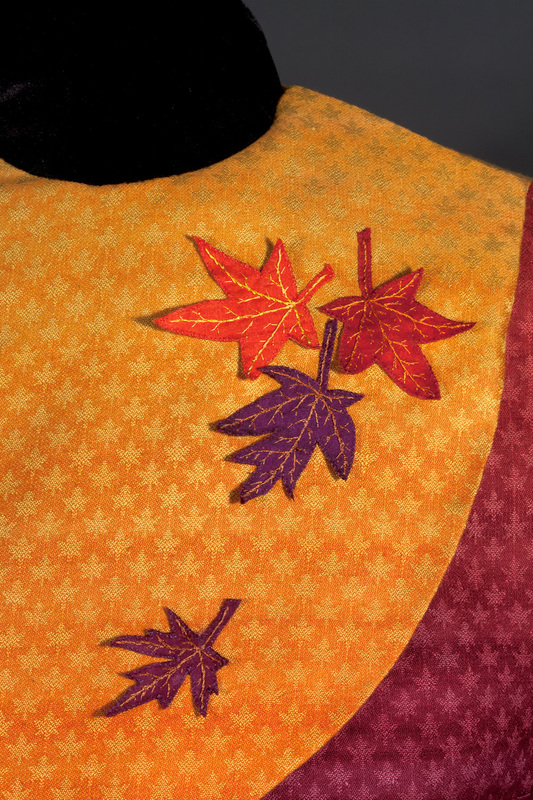 Â This gave color to the leaves, while keeping them distinct from the background. 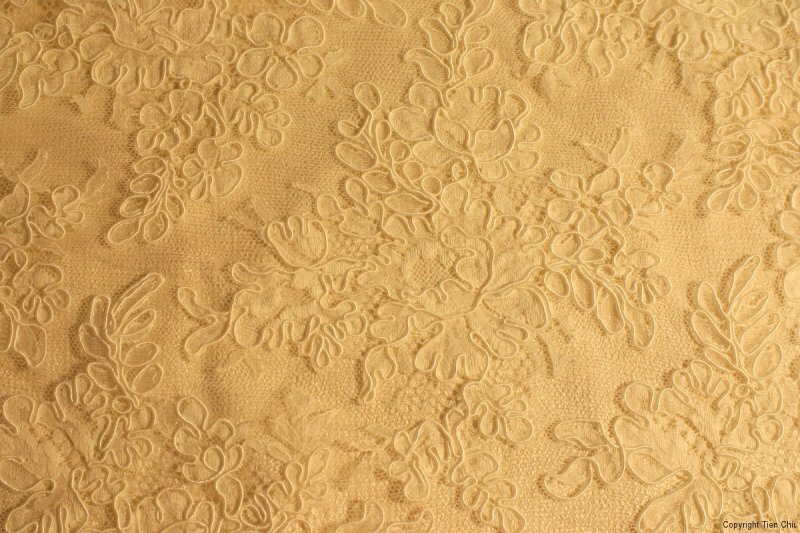 After I finally had the design and all ten panels complete, I completed the design by creating embroidered leaves on the front, stitching together three layers of silk and embroidering on the veins, then overcasting the edges. Â Each leaf took about two hours! The entire eight-month voyage of discovery on this project can be readÂ here. Â Enjoy! 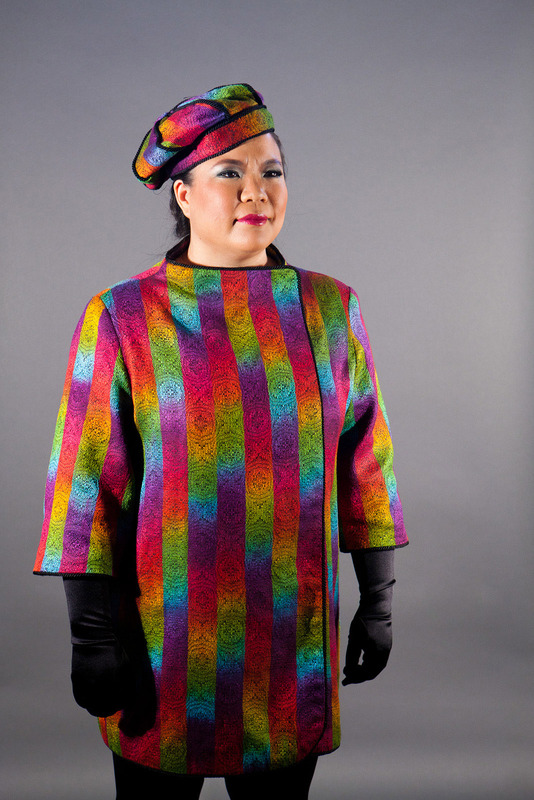 Kodachrome was my response to the Handwoven Garment Challenge in 2011. Â Ten garments, five loom-shaped and five tailored, would be selected to appear in the Vav Fashion show in Sweden, and would be published inÂ Handwoven. I decided it would be fun to enter, andÂ Kodachrome was born. I considered my design carefully. 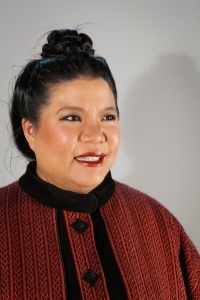 Â At Convergence 2010, I had noticed that the best runway garments were the dramatic ones, with lots of color ““ delicate, beautiful, subtle patterns simply vanished from forty feet away. 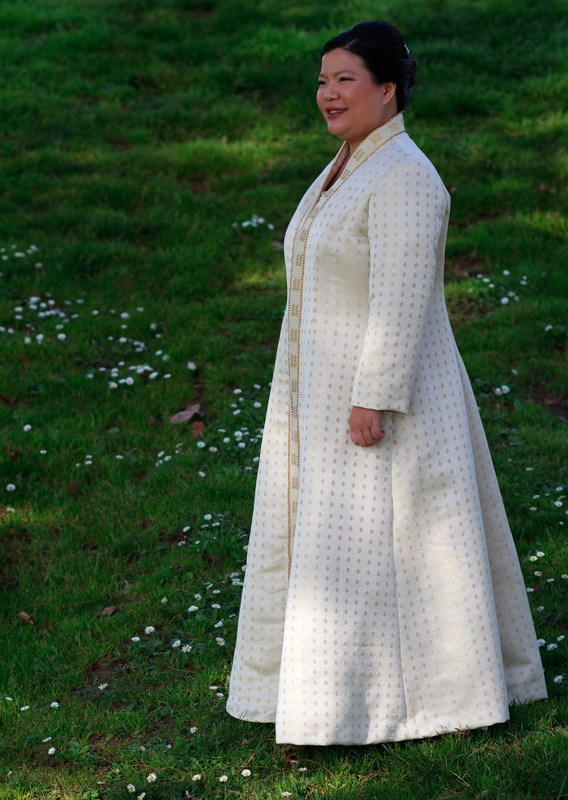 Â I wanted Kodachrome to play well on the runway, but I also wanted it to reward the close-up viewer. 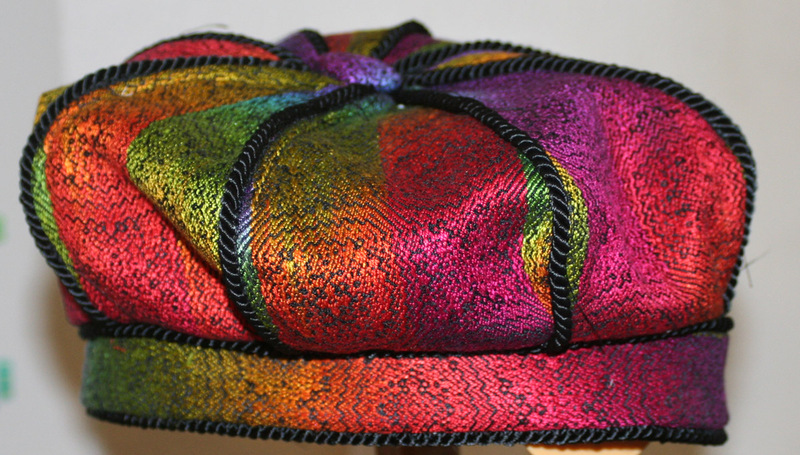 Â So I knew I wanted a colorful project, with bold colors, but also with an interesting woven pattern to reward the up-close viewer. 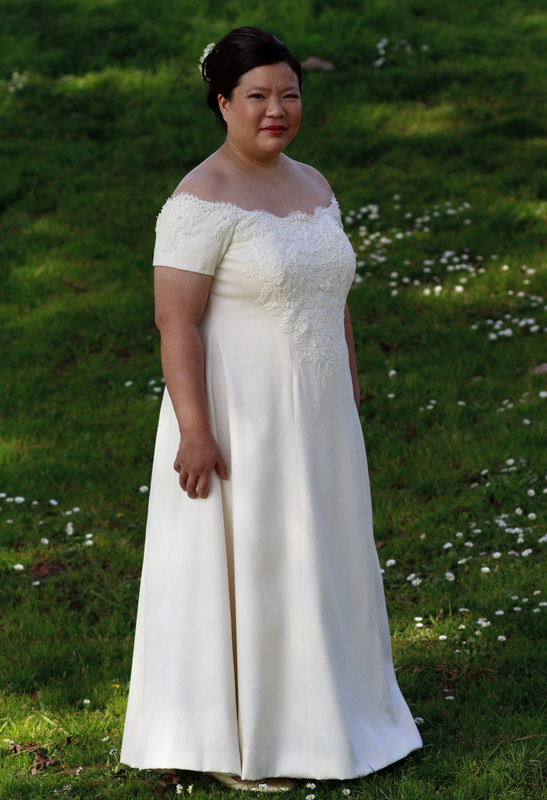 There were other design considerations. 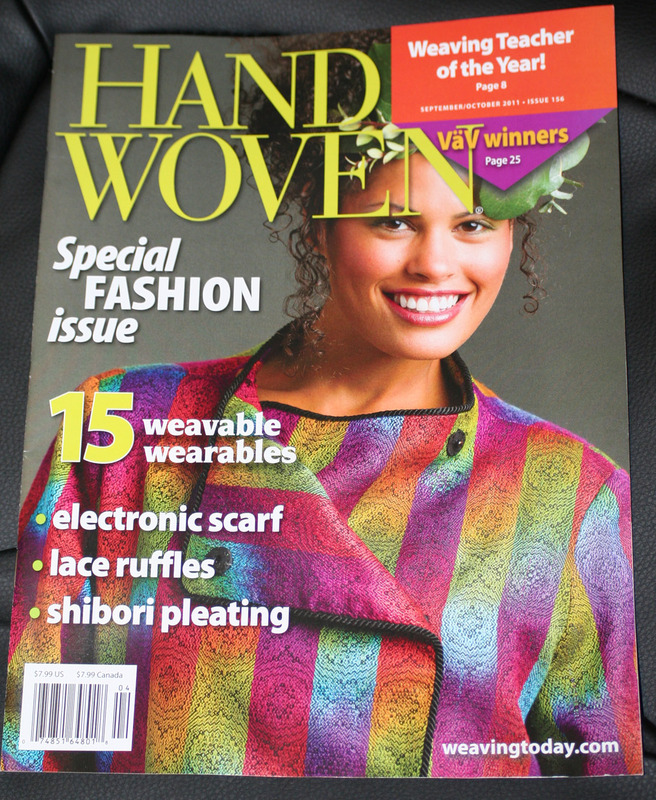 Â Because (if it won) it would be published inÂ Handwoven, I had to make it suitable for aÂ Handwoven article. 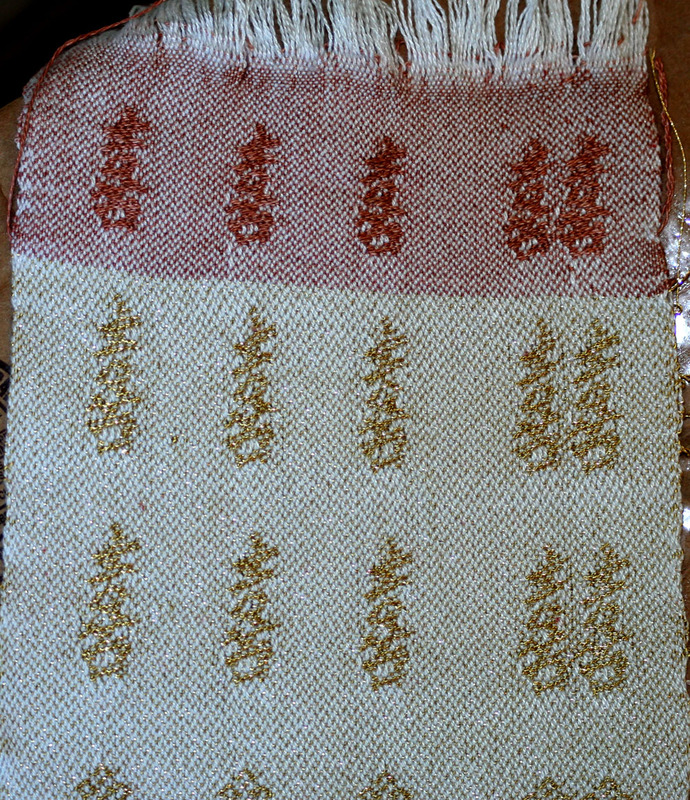 Â This meant weaving something on eight shafts or less (as opposed to my customary 24), using commercially available yarn, a commercial pattern, and using techniques simple enough to explain in three magazine pages or less. 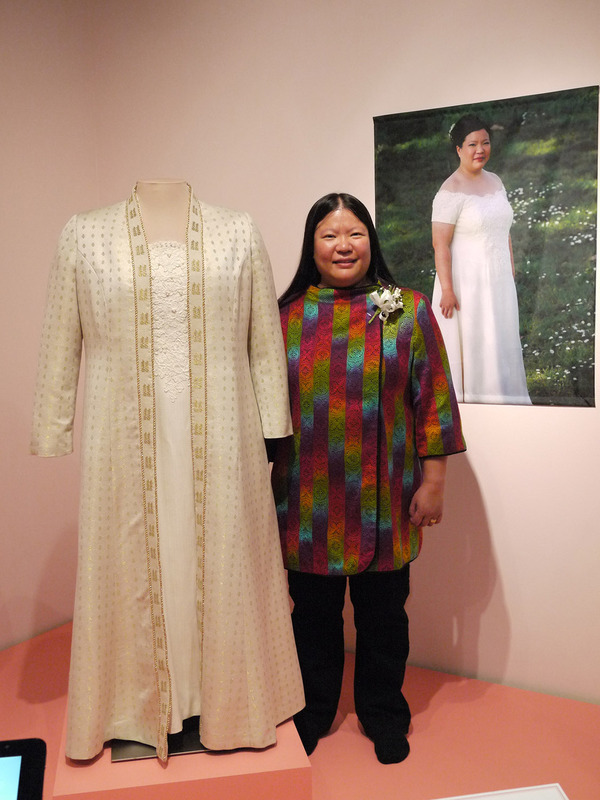 Â It also had to be designed, woven, and sewn in just two and a half months, since the contest began in mid-January and finished up on April 1. 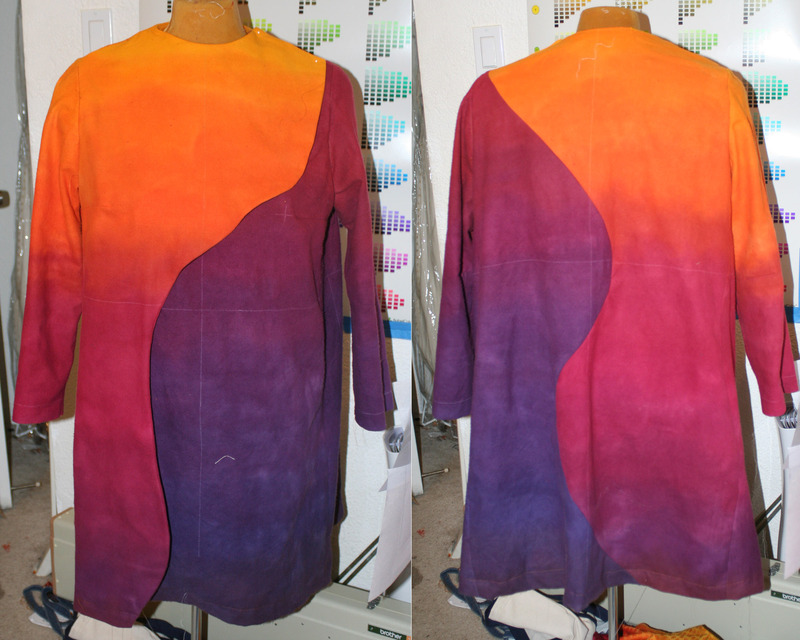 Given the timeframe, I didn’t have a lot of time to experiment or design. 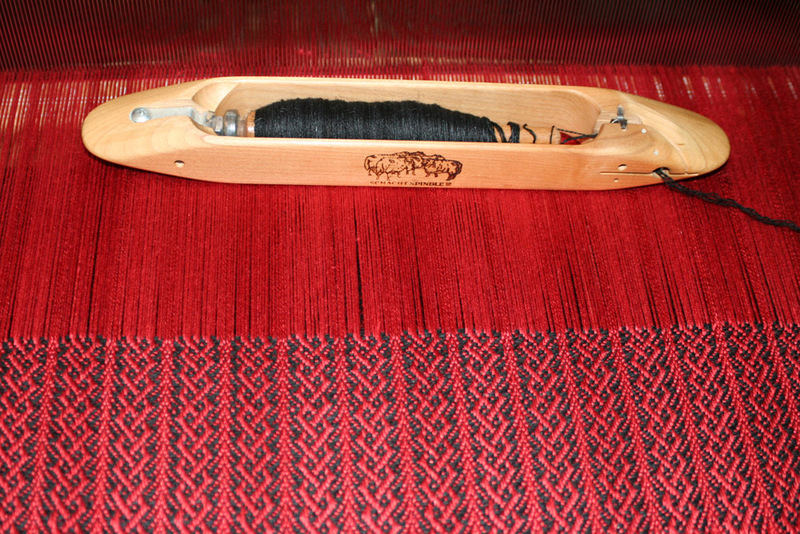 Â I decided to use a painted warp, as this could be done quickly with yarns I had in my stash, and to use 30/2 silk, because I had gobs of it on hand. 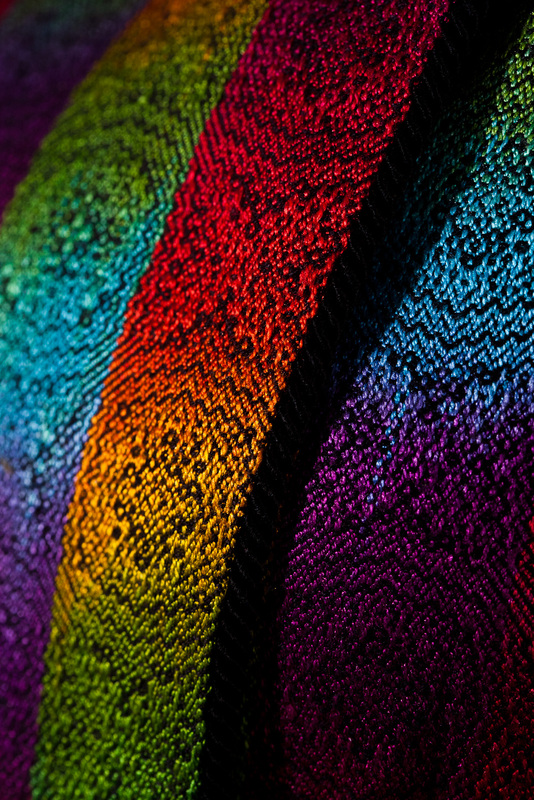 Â But I didn’t want to do a warp painted in a single bout ““ the scarves I’d seen that were wound in just one bout looked boring and predictable, and I wanted this piece to be jazzy and exciting. Â So I decided to use stripes, each warp-painted in the same colors, but offset from each other so the colors wouldn’t “pool”. 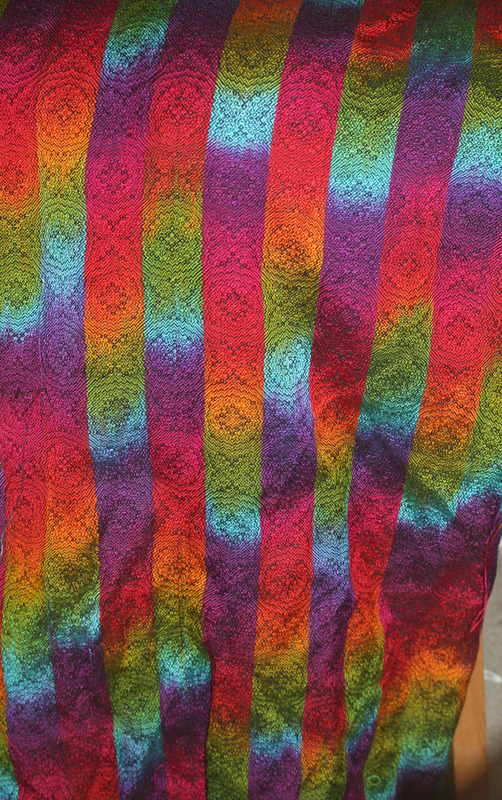 Now I needed a pattern to go with the stripes of color. 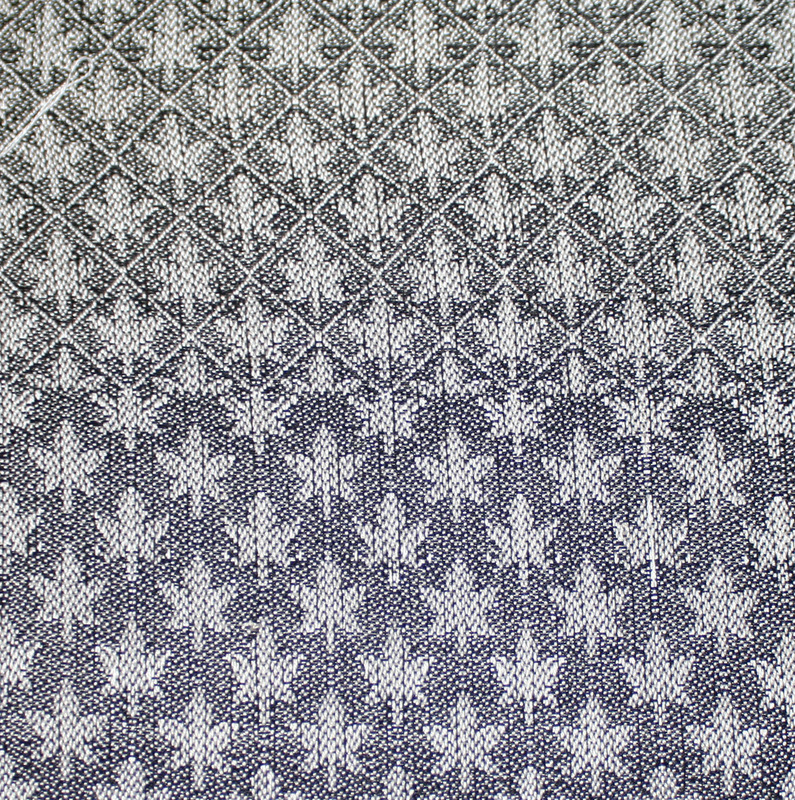 Â I didn’t have much experience with 8-shaft designs, so I flipped through Carol Strickler’sÂ A Weaver’s Book of Eight-Shaft Patterns until I found design #173, an advancing point twill. 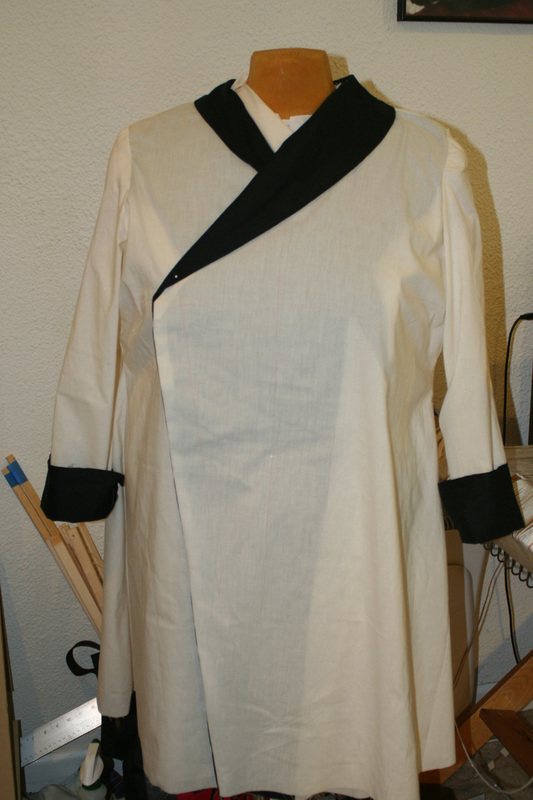 Â I liked the overall look, but it didn’t quite suit my needs, so I made significant alterations to it, changing the look and the size of the pattern to suit the width of my stripes. 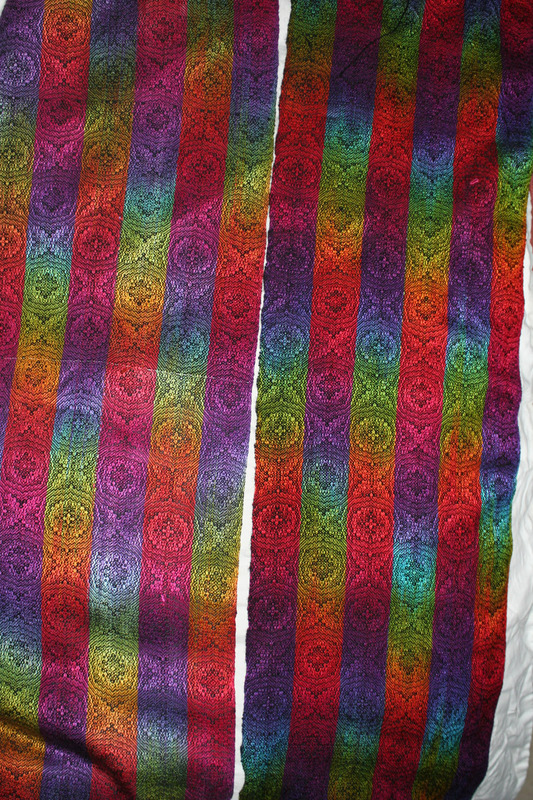 The left-hand sample had less dye, the right-hand sample had more dye. Â In the left sample, I experimented with having the colors semirandomly arranged in the piece; in the right sample, I tried to line the colors up more precisely. Then we sewed several muslins, perfecting the fit. 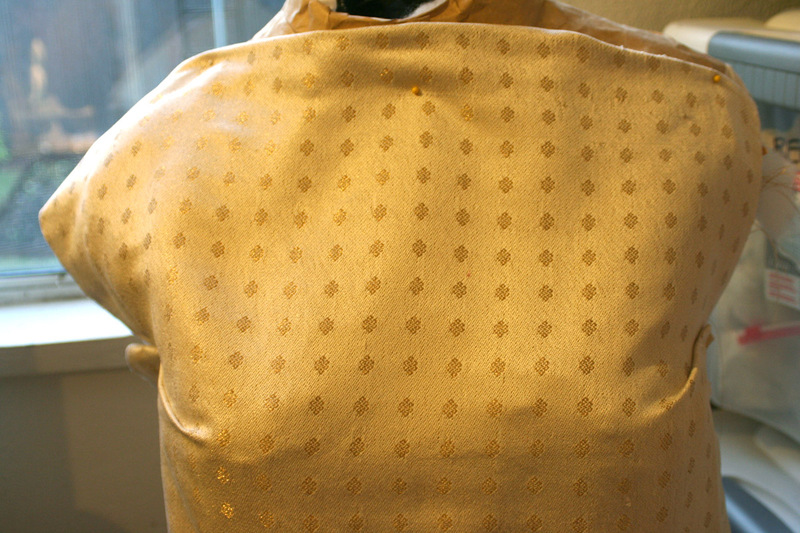 Â On the final few muslins, I drew lines on both the fabric and the pattern, practicing matching the stripes, until I was pleased with the results. Â We added heavy black piping to the edges to help define them, and lined the jacket in black silk charmeuse. A hat! A most magnificent hat! 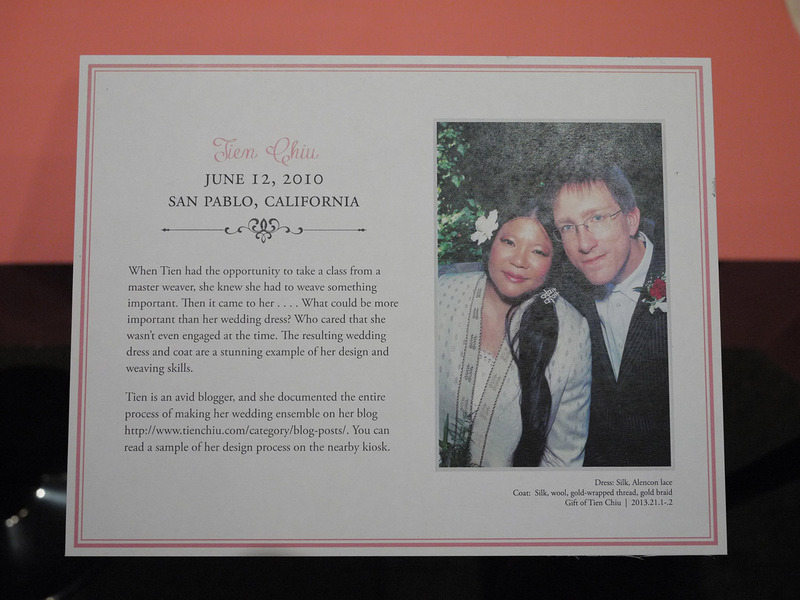 The complete story of Kodachrome can be found at http://www.tienchiu.com/tag/kodachrome-jacket/ . 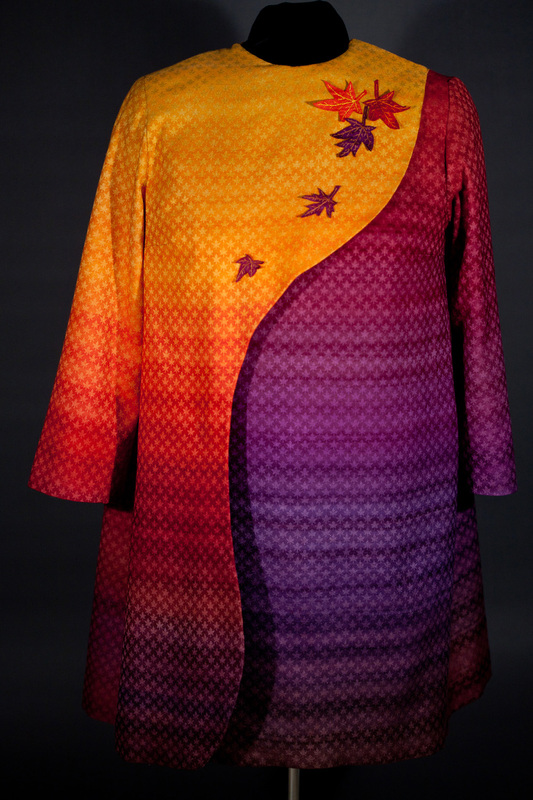 In April 2009, I took a workshop on designing fabrics from Sharon Alderman at the Conference of Northern California Handweavers.Â For the workshop, we were asked to come up with an idea for a finished piece, so we could choose yarns and design the fabric to suit the finished work. 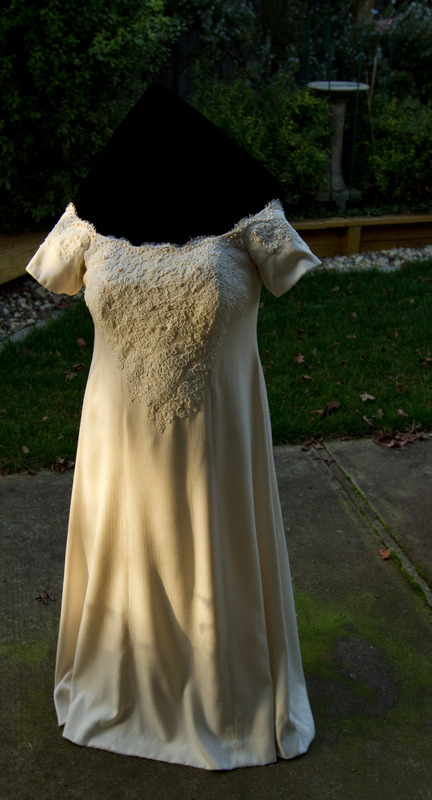 I was racking my brains, wondering what would be challenging enough to need the expertise of a legendary weaver, and finally decided to design what I had always wanted to make: a handwoven wedding dress! I was not engaged at the time, so this was a purely theoretical project.Â I had a pattern that I really loved, and a vision of the pattern with a ribbon of Chinese double-happiness characters going down the front opening, and Asian “eternity knots” in the body of the dress. 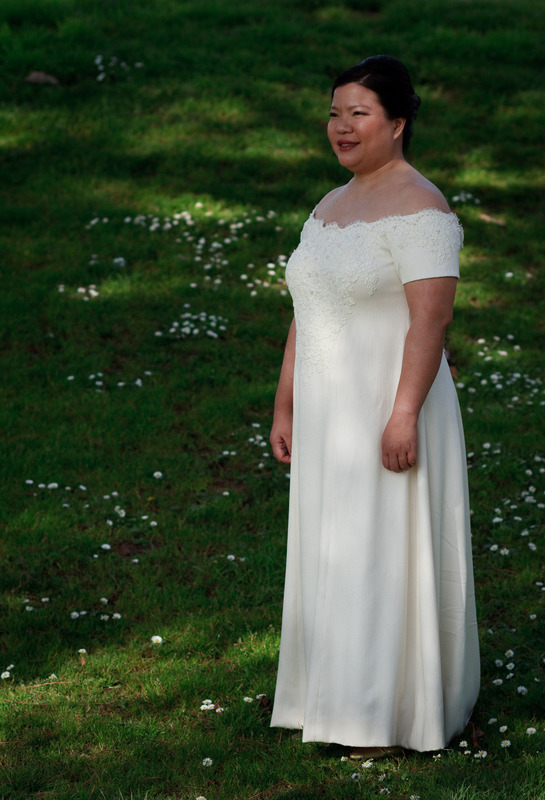 Not the most romantic proposal, but…the wedding was on!! 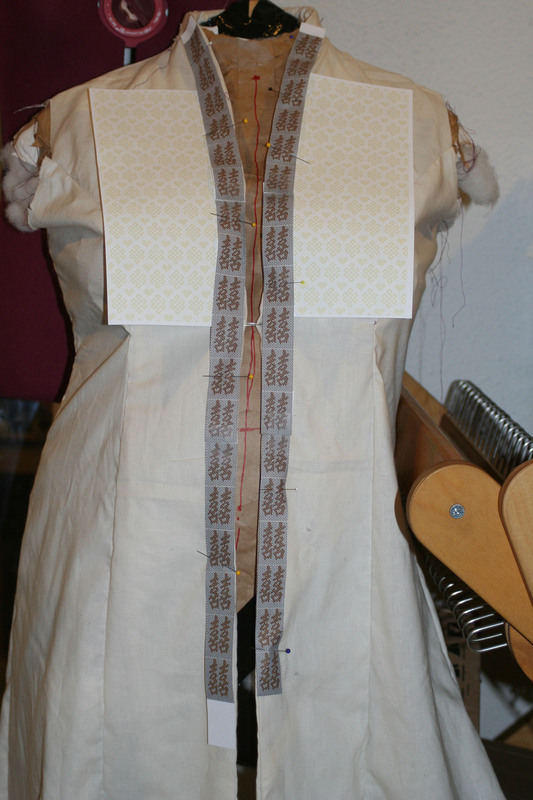 I started sampling for the dress and coat, drafting several different patterns and dyeing various weft colors.Â Because I had a very narrow loom, my cloth would be at most 24″ wide, so I had to weave double the required yardage.Â I decided to weave 16-20 yards of each fabric. 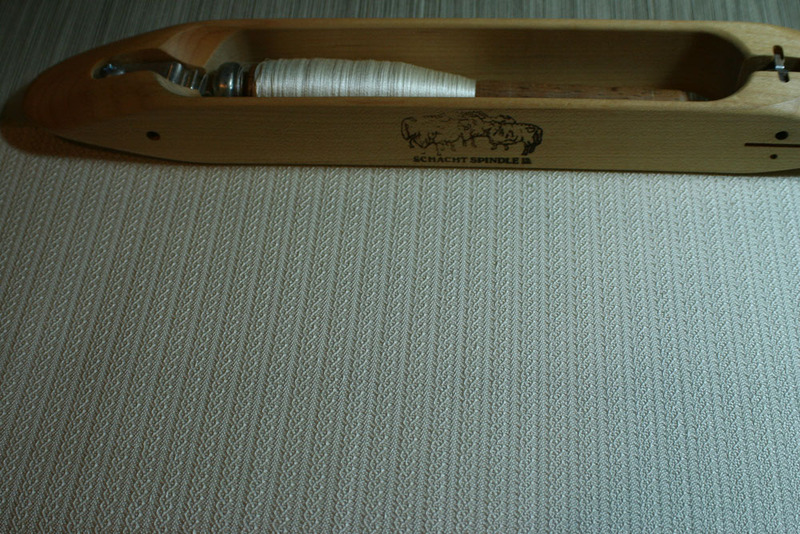 My first effort was disastrous.Â I had only been weaving for a bit over 2 years when I started the project, and I innocently sett the 60/2 silk warp at a whopping 96 ends per inch!Â That turned out to be far, far too dense, producing a very sticky warp.Â And I wound on the warp too loosely, resulting in nightmarish tension problems.Â Despite all this, I wove off ten yards of the warp in about six weeks.Â Then I took some time for contemplation, and realized that the fabric was too flawed to use.Â I set it aside, having learned a lesson in what not to do. Back to the drawing board.Â This time, I got troubleshooting help from some very experienced weavers, who helped me solve my tension problems and my sett problems, and sett the warp at 72 ends per inch.Â This was still quite dense, but wove off much better than the previous warp, and I successfully completed 16 yards of it. Now I was faced with a difficult challenge.Â I wanted to sew this wedding ensemble “the right way”, using couture techniques.Â But I didn’t have any experience with couture, and this would not be something I could learn successfully from a book.Â So I started networking around the local weaving and sewing guilds, looking for a teacher who could help me sew the dress.Â After several false starts, I found Sharon Bell, a fashion school professor emeritus and former couturier, who agreed to help me.Â Her contributions have been invaluable, from the perfect fit of the garment to some of the interior construction to endless suggestions on how to make it better. 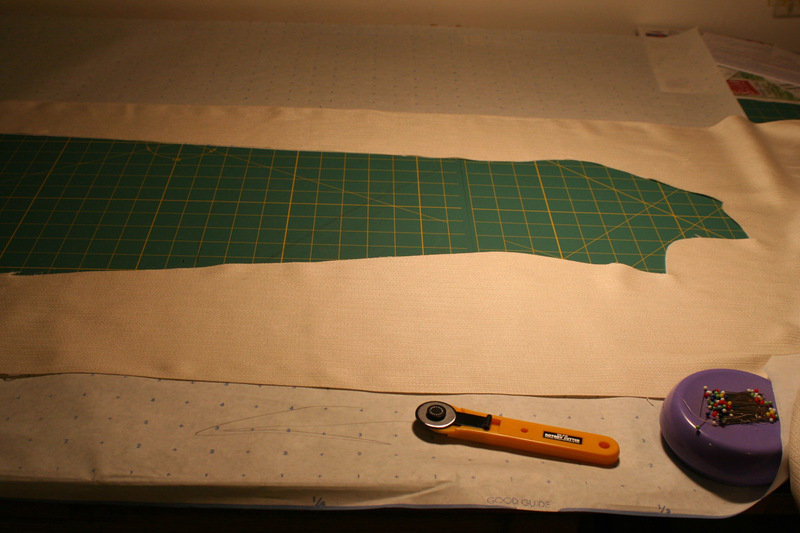 First cut into my precious handwoven! 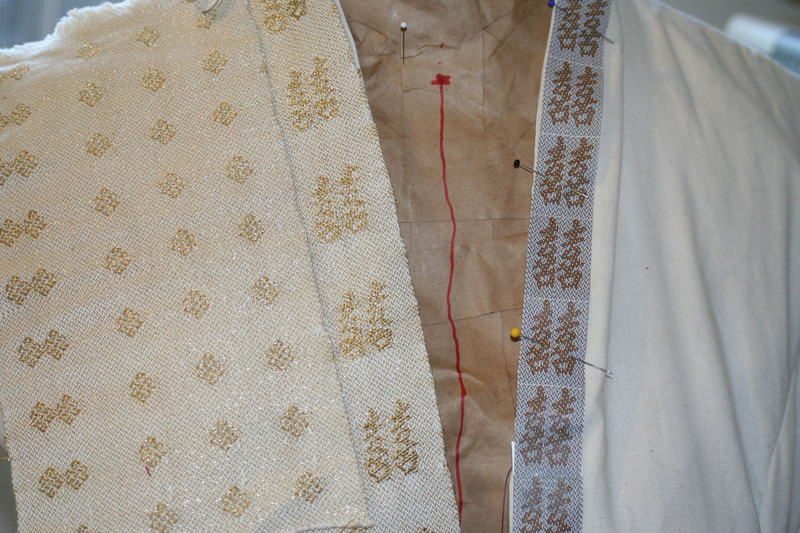 At the same time I was sewing, of course, I was also sampling and weaving the coat fabric.Â I had settled on a pattern of Tibetan eternity knots, woven in silk and a very fine metallic gold thread.Â This warp was sett less densely than the dress fabric, at “only” 60 ends per inch, and wove off beautifully. 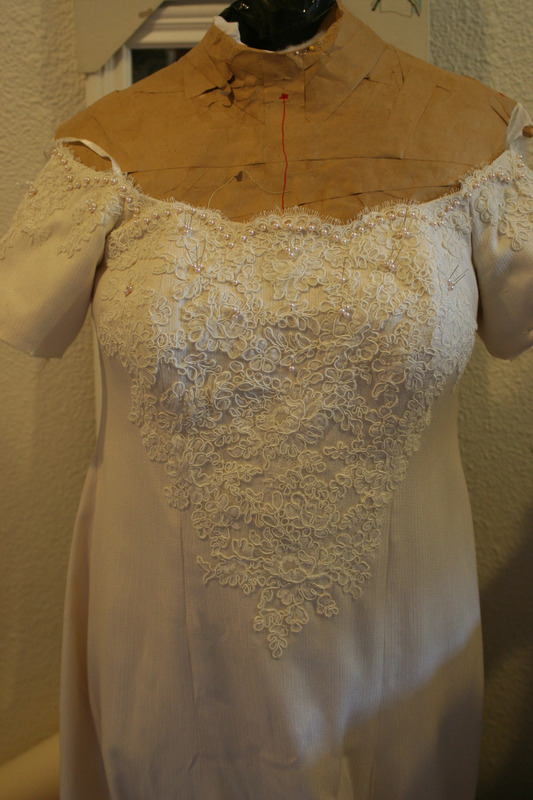 Meanwhile, on the dress, we had started constructing the garment.Â Sharon constructed a “mini-corset” inside the dress, which would a firm foundation to the off-the-shoulder design.Â Once the interior construction was done, I started applying some gorgeous imported French Alencon lace that my future mother-in-law had bought for me, enhanced by real 4.5mm Akoya pearls – the same cultured pearls that you would find in fine jewelry. 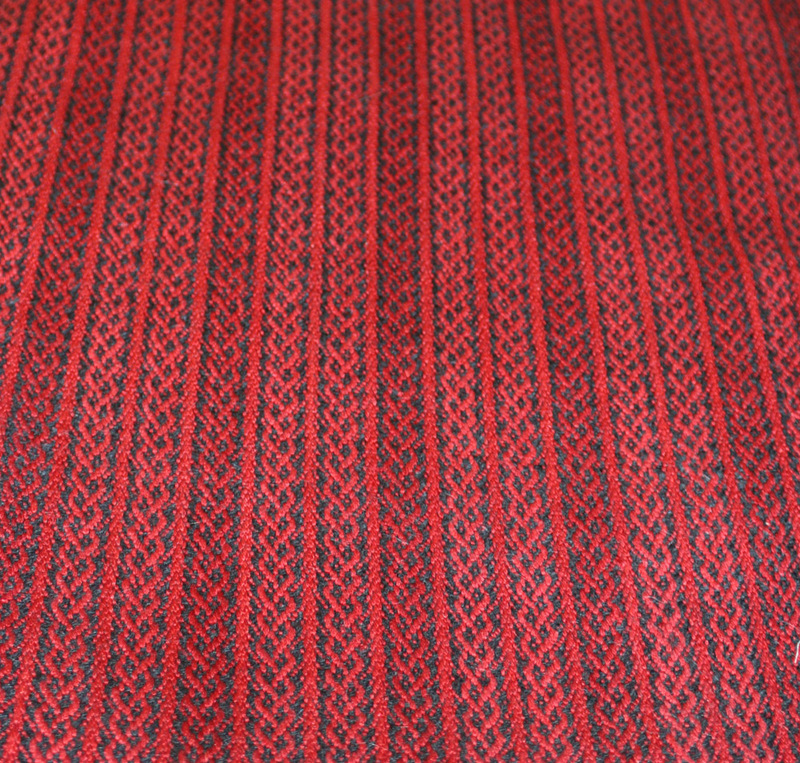 I wanted the double-happiness ribbon to run down the front of the coat, but we would need to shape the ribbon considerably around the neck edge.Â Because of this, I couldn’t weave it in silk; the warp would have to be wool.Â I spent nearly a month ordering samples and running around after false leads until Laura Fry, a weaving friend of mine, very nicely sent me some samples of Silk City 2/28 merino, and then sent me the larger quantity that I would need to weave the ribbon.Â It worked! 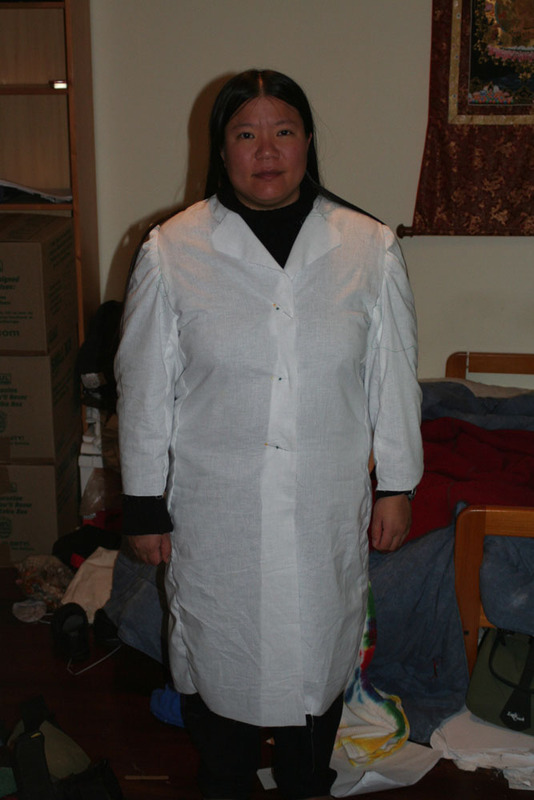 and we assembled the coat successfully. 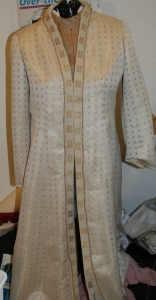 Now, close to completion, we started work on the tedious handwork.Â Much of the work in couture is in the details: how the seams are finished, how the hem is done.Â As a small example, there are five rows of stitching in the dress and coat hems, four of which must be stitched by hand!Â I was giving thanks to every god in range that I had chosen a simple, A-line pattern, not a big floofy skirt with miles of hem. 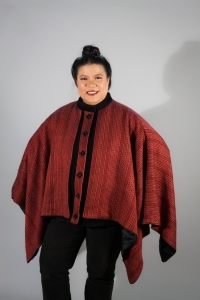 In all, this project took almost exactly one year of intensive work to finish, approximately 1000 hours of hard work, between weaving and sewing.Â Is it worthwhile?Â Absolutely! !Â The finished pieces are gorgeous – beautifully symbolic, museum-quality garments, worthy of what promises to be a wonderful marriage to the man I most love on this Earth. 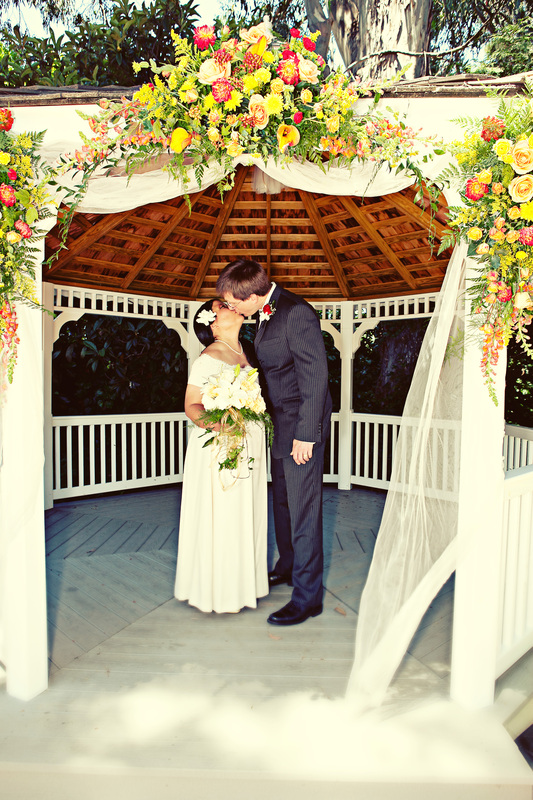 Together, they symbolize a wish for eternal happiness in marriage. A mockup of the coat, using the sample fabrics, to show what it would look like with the fabric. 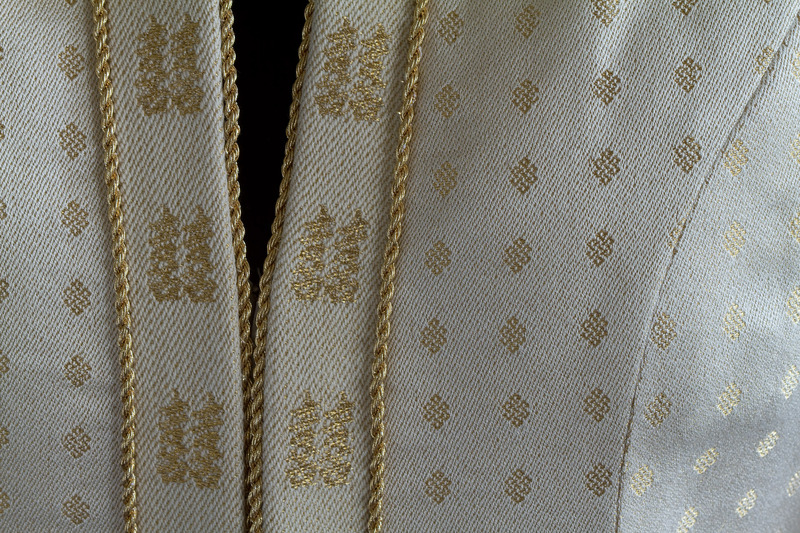 A muslin for the coat, showing the double-happiness ribbons and an eternity-knot variant. I printed the draft out in Photoshop to get a sense for the effect. A sample of the double happiness pattern. The pattern is an eight-shaft satin set against a 4-shaft broken twill. 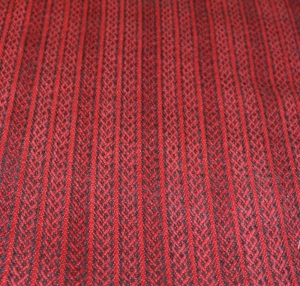 This is the coat fabric being woven. It is composed of three-strand metallic gold floats against a 6-shaft broken twill background. 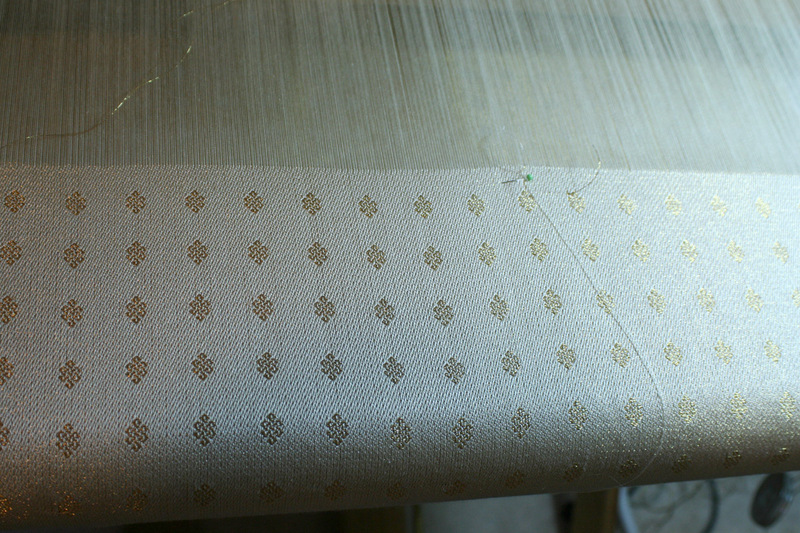 Warp is 60/2 silk, weft is 2 strands of a thin gold metallic. The eternity knot fabric draped over a dress form. It's beautiful! A closeup of the finished eternity knot fabric. 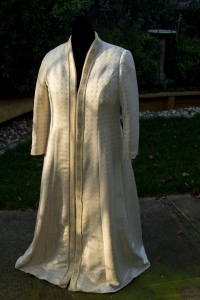 Handwoven wedding coat, draped over dress form. Photo by Joe Decker, Rockslide Photography. 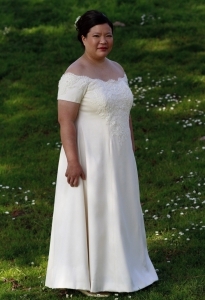 Me looking down at the front closure of the wedding coat. Photo by Joe Decker, Rockslide Photography. 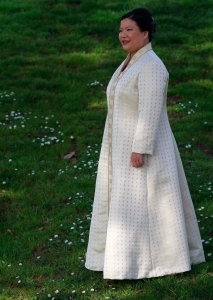 Three-quarter view of me in the wedding-coat. Photo by Joe Decker, Rockslide Photography. The neckline, with the dress peeping through. Photo by Joe Decker, Rockslide Photography. 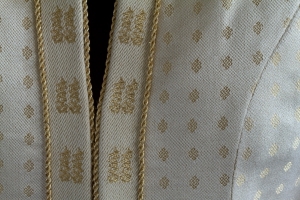 Closeup of a seam in the wedding coat. It took several hours for me to match up all the motifs in all the pieces of the dress. 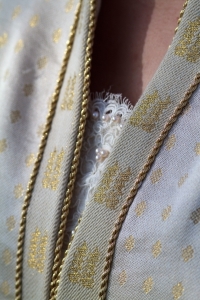 Closeup of the front opening in the wedding coat. You would not BELIEVE what I went through to get those characters to match perfectly! 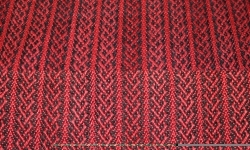 I chose a three-strand Celtic braid pattern (the same as I used in the cashmere coat) for the dress fabric, and experimented with lots of different warp threads and setts before settling on this one. 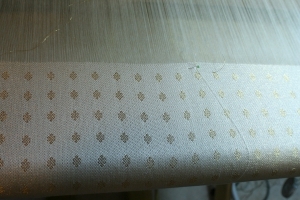 It's 60/2 silk warp, sett at 72 epi, woven with 120/2 silk weft. It's about the weight of a 30mm crepe and is LUSCIOUS! 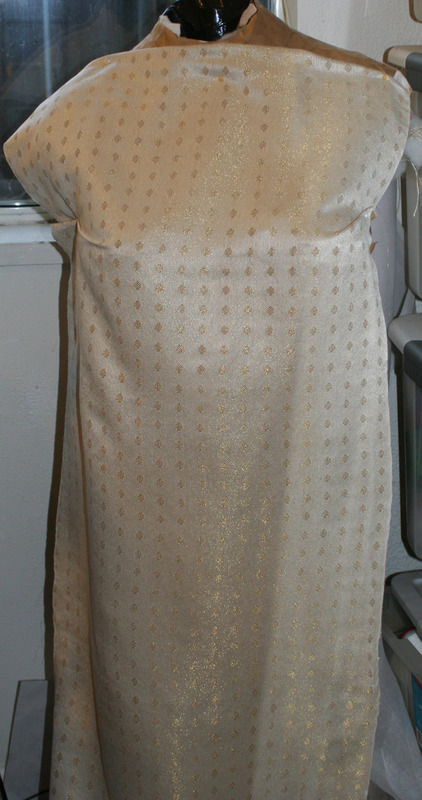 The wedding-dress fabric draped over a dress form, to give an idea of what it will look like in the dress. 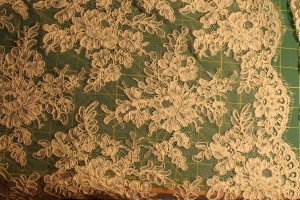 The Alencon lace on the fabric. It's going to be GORGEOUS!! 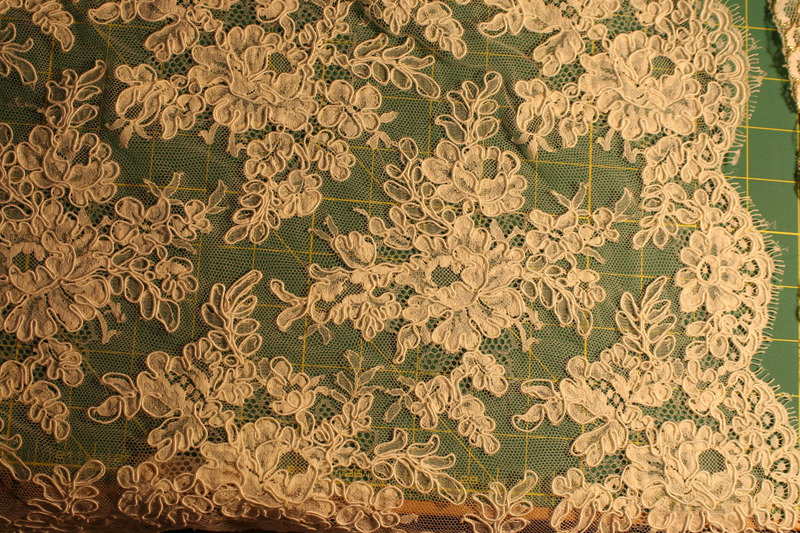 I fell in love with a piece of Alencon lace while shopping at Britex Fabrics with my soon-to-be mother-in-law, and she was kind enough to buy me a yard and a half of it. Is she cool or what??? 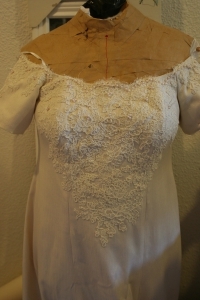 Partially completed wedding dress, with the back lace basted on. An interim view of the wedding dress, with pearls and lace still in the design stages. 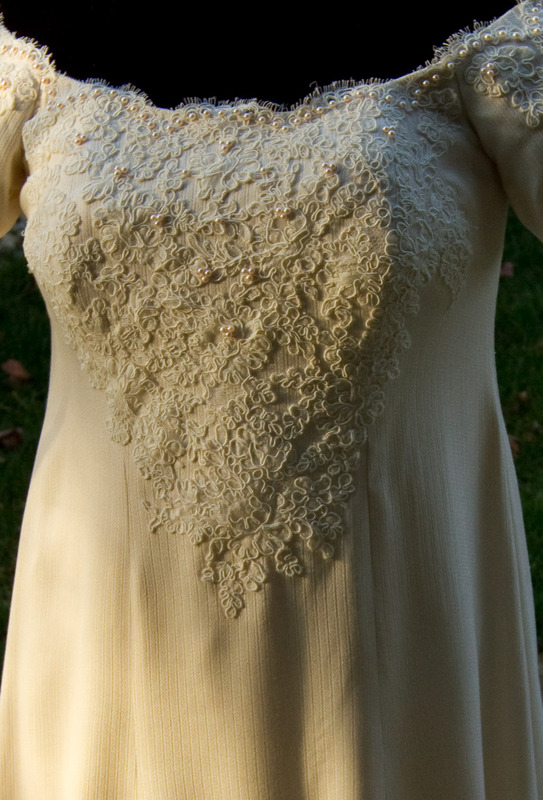 closeup of dress. Photo by Joe Decker of Rockslide Photography.